Caterpillar Local Host Plants: Bambusa multiplex (Poaceae; common name: Hedge Bamboo, Chinese Dwarf Bamboo). 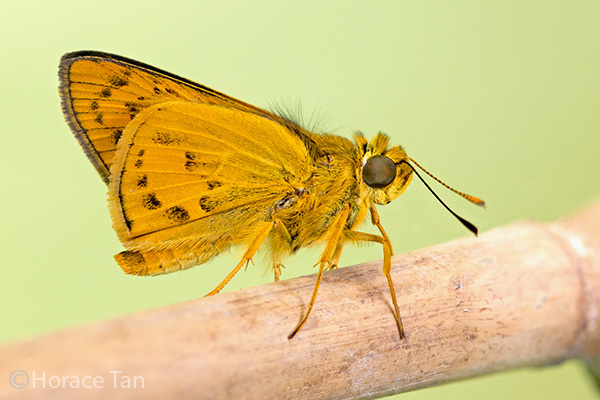 A female Linna Palm Dart, wing upperside view. 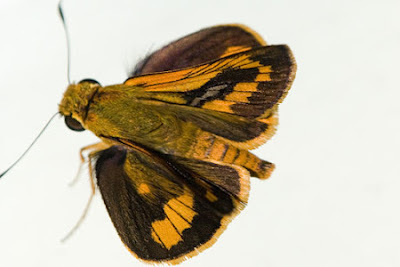 A female Linna Palm Dart, wing underside view. On the upperside, the wings are black with an orange post-discal band on the forewing running from the dorsum and bent over at vein 6 to continue along the costal margin. The orange-yellow post-discal band on the hindwing runs from vein 1b to space 6. The male has a grey brand on the forewing from about the middle of vein 1b to vein 4. The brand is usually straight and not placed closer to the forewing cell or the inner margin of the post-discal band. Base of space 2 in the forewing of the male is black or largely so. The female has the forewing generally darker, with much of the basal organge darkened. On the underside, the wings are ochreous with post-discal bands outlined with black. The veins crossing the orange-yellow band on the hindwing are not dark-dusted. A male Linna Palm Dart, wing underside view. 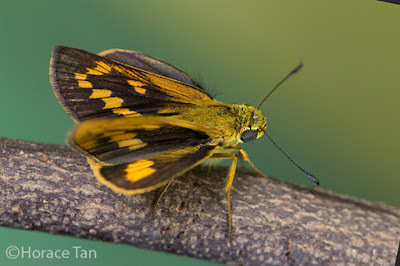 A male Linna Palm Dart, wing upperside view. 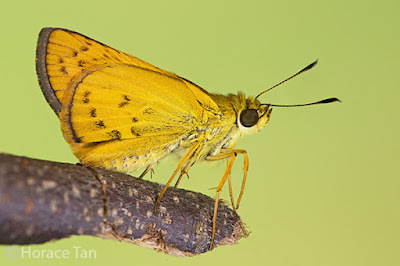 A recent addition to the Singapore Checklist, the Linna Palm Dart is moderately rare in Singapore. The adults are strong flyers and are typically sighted along the forest edge and grassy undergrowth. 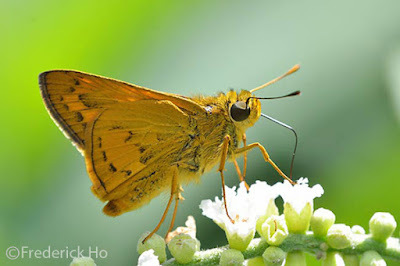 The swift flying adults have been observed to visit flowers and sunbath with open wings in sunny weather. 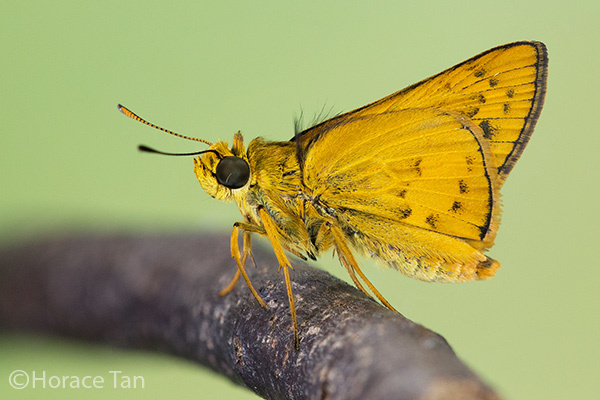 A Linna Palm Dart visiting flowers for its sugary intake. 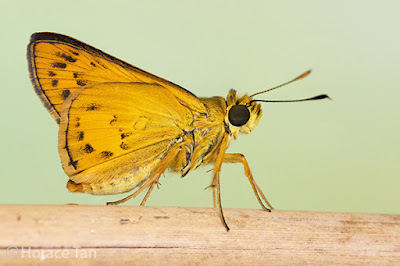 A male Linna Palm Dart.